For the workings of the Papacy mechanic, see Papacy. The Papal State is the manifestation of the temporal power of the pope. Beginning with Urbino as vassal and with the provinces of Roma, Ancona, Umbria, Romagna and Avignon, it is relatively large and prosperous compared to other states in the region. Despite this, it is often subject to early invasion by neighbouring states such as Florence and also Provence which often seeks to acquire the landlocked and isolated province of Avignon with which it shares a border. Naples, while not posing any immediate threat due to its starting situation as a lesser partner in a personal union, will often seek to conquer the Papal State should it ever break free from Aragonese vassalage. The Papal State will never accept diplo-vassalization; they have a -1000 acceptance modifier for the diplomatic action. If the Papal State is annexed then a surviving Catholic theocracy may cede their province to recreate the Papacy. The Papal State is an end game tag and is not allowed to form any other countries. As such, it is the only Italian country that can't form Italy. Papal missions centre around eradicating other Christian denominations from the Italian region and reacquiring lands that once belonged to it before the game start. The Papal State's events center around the inner workings of the Catholic Church. This infobox may contain outdated information that is inaccurate for the current version of the game. The last version it was verified as up to date for was 1.23. With the lands of Northern Italy under the temporal power of the Holy Father rather than any Emperor or King it is now justified to declare this state the Kingdom of God on Earth. Does not have the country modifier "The Kingdom of God"
Adds The Papal State a permanent claim on all not owned provinces of the Italian region. Gets the country event "The Kingdom of God on Earth"
This section may contain outdated information that is inaccurate for the current version of the game. The last version it was verified as up to date for was 1.23. The Papal State is virtually guaranteed maximum prestige. Their unique government type gives +1 prestige and their national ideas give another +1 prestige and -1 prestige decay. With another +1 possible from 100 Devotion the Papal State's prestige drifts to 100 with little player intervention. This provides another -10% aggressive expansion impact and a +50% Better Relations Over Time bonus in addition to the -10% aggressive expansion impact from the national ideas. On top of this, the Papal State has a -25% cost to fabricate claims bonus. Claimed provinces are easier to core and start with lower local autonomy—autonomy that will quickly drop thanks to the Papal State's government type. On top of these bonuses, 100 devotion, high clergy estate influence and one of the Papal ideas can provide a total of +65% global tax modifier in a region with high tax base. The papacy government type is also a fixed rank Kingdom tier government, thus granting the unique ability to join the HRE while keeping the Kingdom Rank, even without an electorate. Like all the theocracies the Papal State does not suffer a stability hit on monarch death, nor regencies. The Papal State is similar to other theocracies in not being allowed to turn their ruler into a general, though The Papal State does not choose an heir. +1% missionary strength when choosing to "just find someone"
The Swiss Guard may give +10% global manpower modifier if the player has good relations with Switzerland. The Papal State can also form the Kingdom Of God, which provides another +10% manpower on top and additional prestige and devotion, and disables the curia. The Papal State also has a very influential Clergy estate, with a +30% influence modifier. This means that the Papal State is one of only a few nations that can always do any interaction with the Clergy estate. Since estate interactions grant rewards scaling with the estate's influence, this helps the player gain more administrative power and cheaper advisors if they do choose to give the Clergy additional influence. Lastly, since the yearly papal influence gained by Catholic nations is based on the Papal State relation score with them, all the Catholic nations will try to keep their relationship maxed, avoiding cases of the Papal State being unable to ally a Catholic nation because his own opinion toward said nation is negative. This also means that Catholic nations who become hostile or rival towards the Papal State will rarely gain control of the curia and are going to lose most of the perks of the Catholicism, thus granting the Papal State an automatic advantage toward enemies and rivals in the Catholic world. All of this means that as soon as the Papal State negotiates the opening stages of the game, perhaps by appeasing Austria and joining the Holy Roman Empire, is set to become a very offensive player in the European scenario, capable of expanding fast with minimal negative repercussions. The Papal State starts small, surrounded by acquisitive opponents. The right combination of alliances should forestall aggression, but the fact that almost all the northern Italian states are in the HRE will hinder expansion. The Shadow Empire event in 1490 may remove the Italian princes from the HRE. Venice and Naples are potential non-HRE rivals. 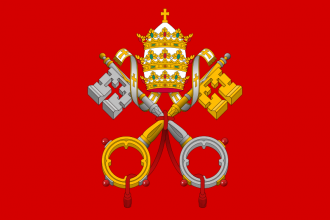 As with all theocracies, the Papal State cannot have royal marriages or personal unions, and since it is not a monastic order cannot make its leader a general unless the government reform "Magister Militum Dei" is taken. Unlike other theocracies it cannot become an Empire, and cannot change its fixed government type. The fixed rank and government type also fix the number of possible states to a maximum of 15 before technology and idea bonus, that will be somewhat lacking after the conquest of the Italian peninsula. Papal State is also locked into Catholicism, but cannot get the perks other Catholics get from spending papal influence and has to deal with the Reformation without the ability to adopt a more tolerant religion, starts the game with the Blasphemy Act modifier that grants +1% missionary strength, but also a -1 tolerance of heretics that stacks with the usual Catholic low heretic tolerance for a total of -4 tolerance of heretics at the start of the game. Provinces that convert during the Reformation will be locked out of conversion for 30 years, and that is a massive swing towards rebellion and due to the very low heretic tolerance, not even adopting the humanist idea group can prevent the Papal State from a loss in religious unity. Low religious unity will raise corruption, that will increase all monarch power costs up to intolerable amounts unless rooted out by investing time and an exorbitant amount of gold. Luckily the usually high stability will help in keeping rebellion and corruption under control, and the Papal State starts with a +25% religious unity modifier that will prevent things from getting truly nasty. Other than that, the main problem is that after Italy is consolidated the Papal State is going to be surrounded by France, Austria, Hungary, and the Ottomans. Avoiding a direct border will help France remain friendly. The Papal State starts the game as the Curia Controller, but since it can't gain papal influence it can't invest influence to keep its Curia Controller status. Instead the Papal State has an automatic amount of influence invested in the curia controller election based on the number of the existing cardinals in the Catholic world, so struggling to keep the full 49 cardinal seats filled, when chance is given by event, will maximize the Papal State ability to be the next Curia Controller. Encouraging a hostile diplomatic game towards nations that gain several cardinal seats, with an intelligent use of rivalries, hostile diplomatic relationships and event choices, will eventually lower considerably their papal influence gains, thus reducing the influence over the Curia of the most active participants to the papal election. A more uncommon way the Papal State has to improve its control over the Curia is the ability to willingly increase the death chance of the Pope to cause an immediate new election. A few events available to the papacy include choices that could result in the death of the Pope, so picking those choices when the Curia is under foreign control will give a chance for a new election. Due to the papacy government type there will be no stability hit on monarch death. Among all the Catholic Nations the Papal State is in the unique position of being actually capable of greatly lowering the reform desire and slowing down the reformation process. The Veneration of relics, Indulgences and Simony related events for the Papal State grant a choice between a small source of income for free and the banishment of said practices from the Catholic world at the cost of -1 stability. For each practice banished not only the reform desire is decreased by a notable -10%, but also the related event is permanently disabled for all the Catholic nations, thus permanently stopping one of the most important sources of reform desire. Lastly the witch trial event can grant another -10% decrease to the global reform desire for no cost. If the Papal State is willing to pick all the reform desire lowering choices the reform can be slowed to the point of being irrelevant for most of the game. Due to the Papal State's abysmal heretic religion tolerance and the consequent rise in corruption due to low religious unity, this strategy has long term benefits that could outweigh the costs. This decision is available once most of the north Italian peninsula has been annexed. It requires the annexation of several Italian states and the Austrian core of Trent, that could very well slip out of Austrian territory even without player intervention, since it starts the game with Venetian culture and also cores of two different dead countries. The usefulness of this decision, however, is somewhat questionable since while it offers +10% manpower, +1 prestige, +1 devotion and permanent claims on all of the Italian region, it also removes the Curia from the game including the Curia Controller status, weakening all the Catholic nations. The Papal State cannot gain or invest papal influence anyway, but also has a better than average chance of becoming the Curia Controller if the full 49 cardinal seats are spread out in the Catholic Europe, so the consequences of this decision should be carefully judged by the player. Allying Austria and improving relations to maximum can allow the player to join the HRE. Further, being allied to Austria as an HRE prince will prevent demands for unlawful territory as long as Austria remains the emperor. If the player joins the HRE, Florence is an attractive first target. If excommunicated, Florence incurs just under 50 aggressive expansion and gives the player 3 very rich provinces and 2 more trade centers in the lucrative Genoa trade node. Venice is a tempting early target. The Papal State begins with Urbino as a vassal, and Urbino has claims on Venetian territory. Austria will usually rival Venice, so if they are allied they will be an enthusiastic participant. Naples may be vulnerable if they break out of their personal union with Aragon. France can be powerful ally - at least until the player shares a border with them. Selling Avignon to France might be easier than trying to defend it, however Provence is a possible starting rival that owns an estuary city in the Genoa trade node - making it a profitable conquest. By excommunicating them first you might get rid of their allies, and you get a casus belli with reduced aggressive expansion impact. Influence has a lot of synergy with the Papal State's national ideas, while the core costs discount from Administrative is very helpful in the Italian region and synergize well with all the Papal State administrative power discounts and gains. Either of them should be the first idea group. As the Papacy, own Jerusalem and have Livonian Order, Teutonic Order and The Knights as Marches. This page was last edited on 25 January 2019, at 15:47.